After months of preparation, several Amador artists will be debuting their works for the exhibit called “AnimalScapes,” in which 50 artists and poets will explore the diverse animal world found in the Sierra foothills. 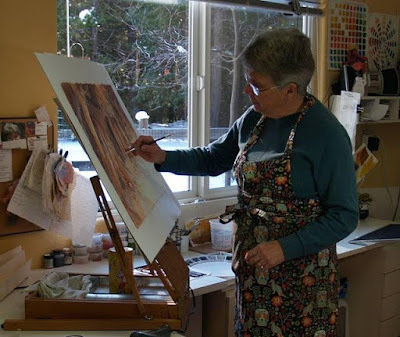 Join artists like Lynne Slade, pictured, as well as art and animal lovers for the Opening Reception at Ironstone Winery in Murphys, on January 16 from 3-5pm. The exhibit, which is free, will continue there daily through February 15th . 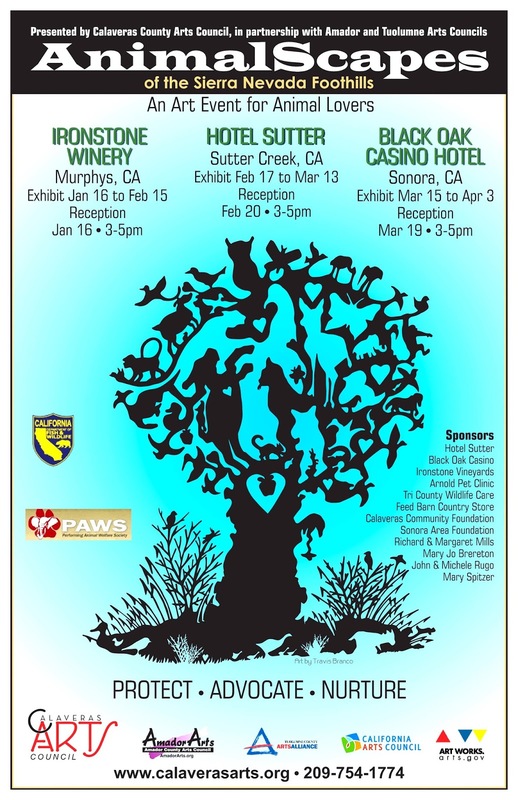 Awards and prizes in several categories will be revealed at the reception, and educators from California Fish and Wildlife, and the Performing Animals Welfare Society will be on hand, as well as representatives from several other rescue organizations. The Sierra foothills are home to such a variety of animal-life, including the exotic (at PAWS), domestic, stock, and wild. Through this art and poetry exhibit, three County arts councils acknowledge and thank all the organizations who advocate for, rescue, and protect our animal communities. Tri County Wildlife Care is bringing several feathered friends to the free reception, including owls and hawks from their “Saving Wildlife Saves Us” educational program. This rescue organization has taken their friendly ambassadors to schools and other events, educating thousands on the importance of saving wildlife and preservation, and maintaining a balance in nature. Live music by Brad Peterson will be featured at the reception; plus a unique opportunity to view wildlife and interact with those who help to protect our fuzzy, furry, feathered, fetlocked friends. Opening receptions in Amador County and Tuolumne County, each with live entertainment, will occur before the start of their month-long “AnimalScapes” exhibit. Save the 3-5 pm times, and the date of Saturday, February 20 for the reception at the Hotel Sutter in Sutter Creek, and March 19 at the Black Oak Casino Hotel in Sonora. AnimalScapes is a landmark art endeavor created by the Calaveras County Arts Council from a “Creative California Communities” grant funded by the California Arts Council and various sponsors. Please go to www.calaverasarts.org, or contact Project Coordinator Sandra Peterson at animalscapes@gmail.com for more information. 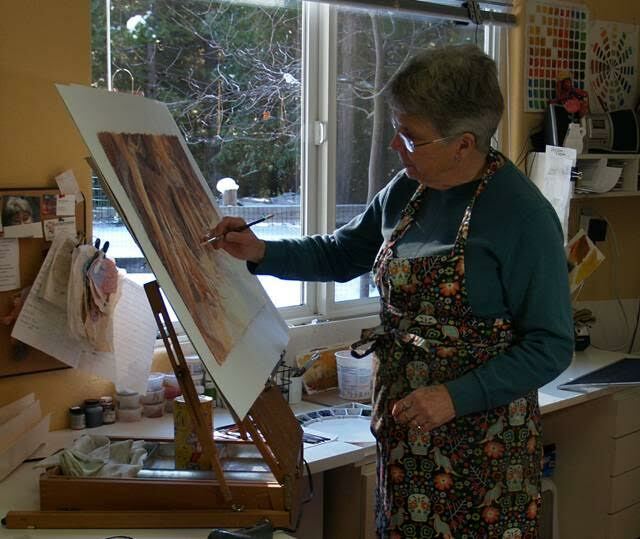 Amador artist Lynn Slade is putting the finishing touches on her work for the AnimalScapes exhibit. See the works of all 50 artists juried into the show starting January 16 in Murphys. We'd love to get to know you better. Please visit Main Street Theater Works on Facebook and take our survey. And if you respond before December 31, you'll be entered into a drawing for season tickets! Patrons are encouraged to come early with picnics, chairs and jackets. Main Street Theatre Works (MSTW) is pleased to announce its 2016 Summer Season ~ our 22nd season bringing professional and community theatre artists together to produce classical and contemporary plays ~ at the Kennedy Mine Amphitheatre in Jackson. 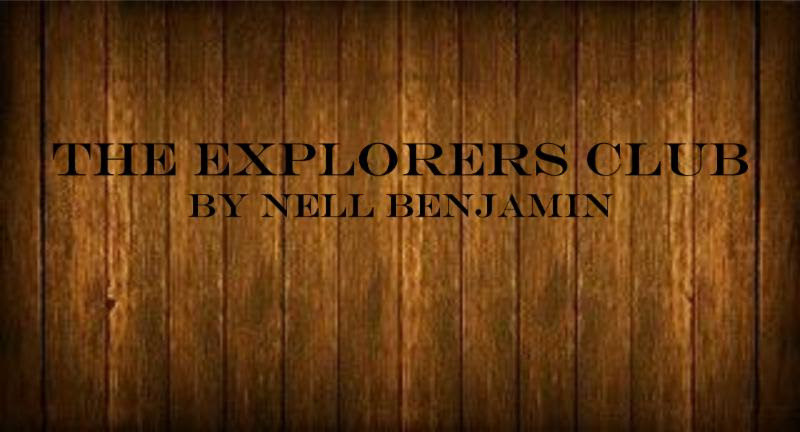 We start off with The Explorers Club, by Nell Benjamin, a comedic look at Victorian adventurers who ponder the mysteries of science and nature, while genteelly getting blotto. It's 1879 and London's prestigious Explorers Club is in crisis: their acting president wants to admit a woman, and their bartender is the worst. True, the female candidate is brilliant, beautiful, and has discovered a legendary Lost City, but the decision to let in a woman could shake the very foundation of the British Empire. And how do you make such an important decision without a decent drink? Time Out NY raves, ". . .the most impressive act of mixology belongs to playwright Nell Benjamin, whose comedy recipe goes a little like this: two parts Blackadder, one part Monty Python, a dash of Shaw, shake wildly and garnish with fresh feminist ire." Rounding out our Summer Season is Luke Yankee's The Last Lifeboat, a fascinating look at the drama behind the sinking of the Titanic. At his father's deathbed, J. Bruce Ismay vowed to take over the family shipping business and build the biggest ship the world had ever seen, the RMS Titanic. As the mighty ship sank, Ismay saved as many people as he could, and with no women and children in sight, Ismay stepped into the last lifeboat, a decision that precipitated one of the greatest scandals of the 20th century. This epic tale explores not only the tragedy of the sinking of the Titanic, but the sensationalized trial and aftermath of one of the world's greatest disasters. "Luke Yankee has written a surging drama that is riveting, dramatic, educational and entertaining all at the same time. 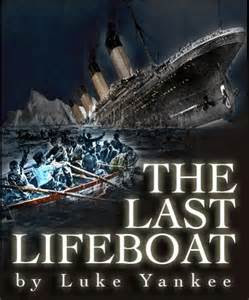 The Last Lifeboat is destined to become a theatre classic!" ~ Rex Reed. See Performance Dates and Times at left, for dates and ticket information. Main Street Theatre Works is thrilled to offer the perfect gift for the holidays ~ Season Tickets to our 2016 Season! For a limited time you can get four shows for only $70 ~ a savings of over 20% off the regular adult ticket price. Plus a ticket to our Fall Fundraiser -- A Live Radio Show reenactment of The Immortal Sherlock Holmes. Along with the tickets, you'll also receive a voucher good at the amphitheatre for a bottle of water or a free cup of coffee with each ticket, and you can use our chairs instead of bringing your own. Both fundraiser performances include a dessert bar, coffee and tea. It's a wonderful way to take advantage of a great money-saving deal, and get "star treatment." And, you'll never miss a show. Plus, you can take care of your holiday shopping with just a click of a mouse. Season Tickets are available through our website atwww.mstw.org. Regular priced tickets are $20.00, for adults, $17.50 for seniors, $12.00 for students 18 and under, and Family 4-packs (2 adults, 2 students) are just $54.00. 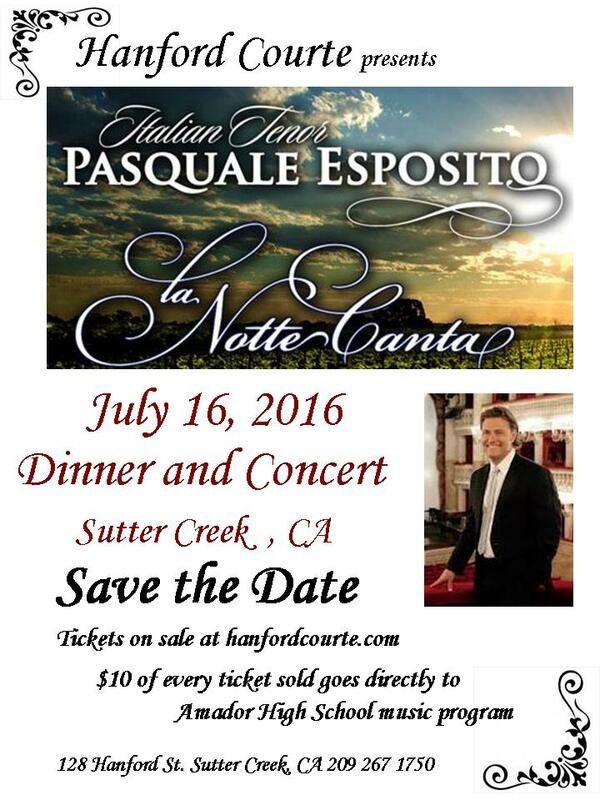 Tickets for our two fundraisers are regularly priced at $25 per show. Dates for our season are: A Weekend of One-Acts (4/1, 2, & 3), The Explorers Club (6/24 - 7/23), The Last Lifeboat (8/12 - 9/10), and The Immortal Sherlock Holmes (10/21, 22 & 23). You can get more information about these shows at our website. Giving the gift of theatre is the perfect solution to holiday shopping for everyone on your list. Give a Gift that Supports the Arts in California! There's a new, easy, and tax-deductible way to support arts education and arts programs this holiday season. is proud to announce a new, a one-of-a-kind voucher program allowing the iconic California Arts Plate to be given as a gift. The new Arts Plate gift voucher program is the first of its kind, allowing you to give the gift of California arts license plates. Your voucher purchase is tax-deductible, and recipients will use their gift voucher to fully cover the purchase of their own unique Arts Plate—which will directly support California arts education and local arts programs for as long as it is on the road. Proceeds from sales and renewals of the Arts Plate provide millions of dollars in support for arts education programs across California. So head on over toartsplate.org and purchase a gift voucher (or two or three) for your loved ones, friends, or colleagues. With California Arts Plates on their cars, they'll send a powerful message to everyone on the road: I’m driving creativity, innovation, and success for California’s next generation! Fill those Christmas stockings with Comedy, Drama and Suspense! Main Street Theatre Works is thrilled to offer the perfect gift for the holidays ~ Season Tickets to our 2016 Season! For a limited time you can get four shows for only $70 ~ a savings of over 20% off the regular adult ticket price! The Season ticket package includes one ticket to our Spring Fundraiser: The 4th Annual One-Act Festival, our two summer shows: The Explorers Club and The Last Lifeboat, plus a ticket to our Fall Fundraiser: A Live Radio Show reenactment of The Immortal Sherlock Holmes. Along with the tickets, you’ll also receive a voucher good at the amphitheatre for a bottle of water or a free cup of coffee with each ticket, and you can use our chairs instead of bringing your own. Both fundraiser performances include a dessert bar, coffee and tea. It’s a wonderful way to take advantage of a great money-saving deal, and get “star treatment.” And, you’ll never miss a show. Plus, you can take care of your holiday shopping with just a click of a mouse. Order before December 15th to receive gift certificates before Christmas! Season Tickets are available through our website at www.mstw.org. Regular priced tickets are $20.00, for adults, $17.50 for seniors, $12.00 for students 18 and under, and Family 4-packs (2 adults, 2 students) are just $54.00. Tickets for our two fundraisers are regularly priced at $25 per show. Dates for our season are: A Weekend of One-Acts (4/1, 2, & 3), The Explorers Club (6/24 – 7/23), The Last Lifeboat (8/12 – 9/10), and The Immortal Sherlock Holmes (10/21, 22 & 23). You can get more information about these shows at our website. 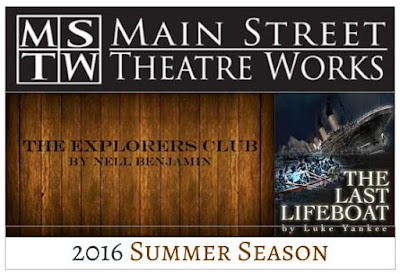 Jackson, CA (November 21, 2015) – Main Street Theatre Works (MSTW) is pleased to announce its 2016 Summer Season at the Kennedy Mine Amphitheatre in Jackson, starting with The Explorers Club, by Nell Benjamin, a comedic look at Victorian adventurers who ponder the mysteries of science and nature, while genteelly getting blotto. It’s 1879 and London’s prestigious Explorers Club is in crisis: their acting president wants to admit a woman, and their bartender is the worst. True, the female candidate is brilliant, beautiful, and has discovered a legendary Lost City, but the decision to let in a woman could shake the very foundation of the British Empire. And how do you make such an important decision without a decent drink? Time Out NY raves, “. . .the most impressive act of mixology belongs to playwright Nell Benjamin, whose comedy recipe goes a little like this: two parts Blackadder, one part Monty Python, a dash of Shaw, shake wildly and garnish with fresh feminist ire." 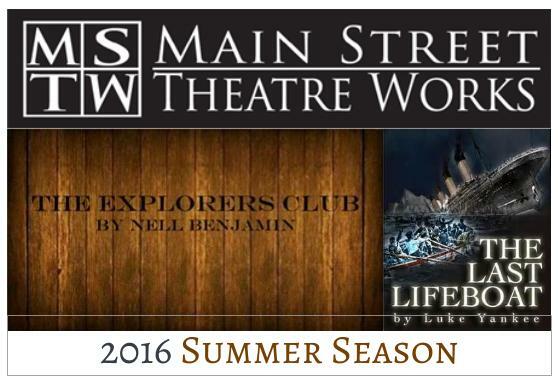 The Explorers Club runs June 24th - July 23rd. Rounding out MSTW’s Summer Season is Luke Yankee’s The Last Lifeboat, a fascinating look at the drama behind the sinking of the Titanic. At his father’s deathbed, J. Bruce Ismay vowed to take over the family shipping business and build the biggest ship the world had ever seen, the RMS Titanic. As the mighty ship sank, Ismay saved as many people as he could, and with no women and children in sight, Ismay stepped into the last lifeboat, a decision that precipitated one of the greatest scandals of the 20th century. This epic tale explores not only the tragedy of the sinking of the Titanic, but the sensationalized trial and aftermath of one of the world’s greatest disasters. “Luke Yankee has written a surging drama that is riveting, dramatic, educational and entertaining all at the same time. The Last Lifeboat is destined to become a theatre classic!" ~ Rex Reed. The Last Lifeboat runs August 12th – September 10th. Main Street Theatre Works is a professionally oriented theatre company, performing in the heart of Amador County. Now entering its 22nd season, MSTW continues to be dedicated to bringing professional and community theatre artists together to produce classical and contemporary plays, striving for a balance that stimulates both artists and audiences.